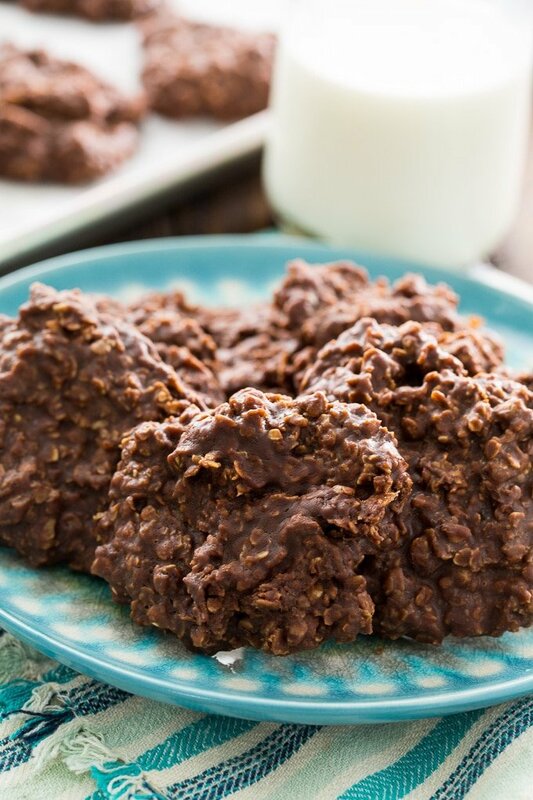 No-Bake Chocolate Oatmeal Cookies are an old-timey favorite and one of the easiest and most delicious cookies you’ll ever make. I think pretty much everyone has had these cookies at one time or another and pretty much everyone loves them. No oven needed for these cookies which have the most amazing texture and you likely have all the ingredients on hand. You’ll need butter, unsweetened cocoa powder, sugar, milk, quick-cooking oats, peanut butter, and vanilla extract. Then remove the mixture from the heat and stir in the remaining ingredients. So simple! In less than 10 minutes you can have the ingredients measured, the batter mixed together and shaped into cookies. 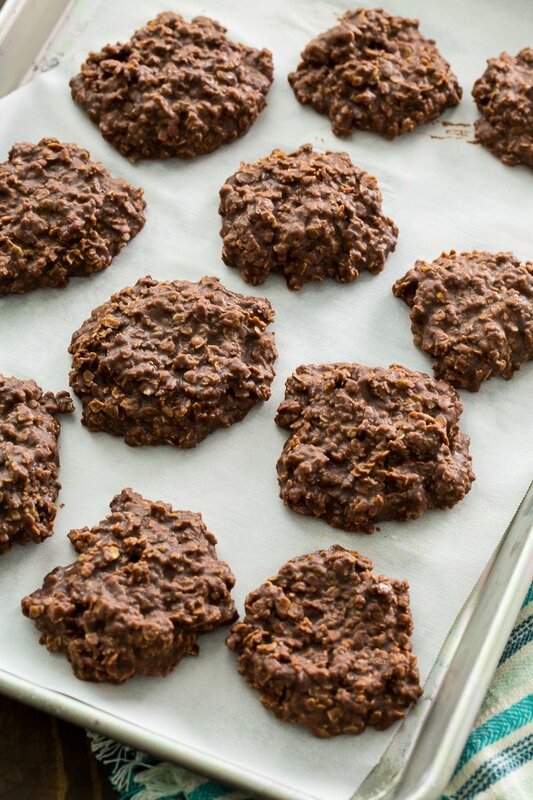 These No-Bake Chocolate Oatmeal Cookies do need a little while to set, but you won’t have to wait long. They should only take about 30 minutes to set up. If they are still too wet at this point, try sticking them in the fridge. Watch the video below to see how to make these easy cookies! 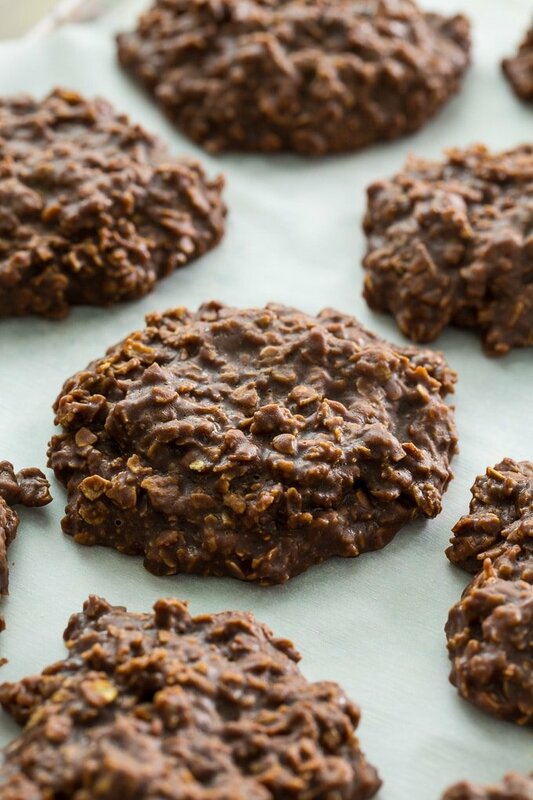 No-Bake Chocolate Oatmeal Cookies are an old-timey favorite and one of the easiest and most delicious cookies you'll ever make. I think pretty much everyone has had these cookies at one time or another and pretty much everyone loves them. Stir well and bring to a boil over medium heat. Boil for 90 seconds, stirring occasionally. Remove from the heat and stir in the oats, peanut butter, and vanilla. Drop by heaping tablespoonfuls onto baking sheets lined with wax paper or parchment paper. Let cool to set. 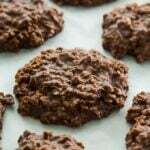 This entry was posted in Cookies and tagged chocolate, cookies, no bake. Bookmark the permalink. They should set almost instantly into fudge even in a warm room. This recipe is all messed up. You have to combine butter, peanut butter, sugar, milk and cocoa, stir constantly til it boils then stir for 3 minutes. Remove from heat add the vanilla and stir. you’ll see it do it’s magic fizzle, then quickly add oats stir and the drop on parchment paper!!! This is great just the way it is!!! Instead of making cookies I spread the mixture out in the parchment paper cool and cut into small bites. Sometimes I don’t want a whole cookie!!! That is a great idea. And so much easier to do. You could even cut shapes out I love it. I have made these for years.. however, I still haven’t been able to replacate..the exact way the lunch ladies did it. Theirs always we’re glossy and perfectly chewy and smooth. Anyone?? Mine are usually dryish and kinda crumbly. Maby add a littel more butter? Please try cooking it for less time. If they come out too gooy just let them sit in the fridge for a day or two and they will dry out a bit. Also weather (moisture) plus or minus will make a difference! I always beat the neck out of it after adding the vanilla, etc. Be sure not to boil too long because that can dry them out. I’ve found that by placing cling wrap over them as soon as you place onto the cookie sheet they will stay nice and moist. If you add a bit extra vanilla extract they will not be as dry also. 1. Use at least 2% or, better yet, whole milk. If using skim and 1%, add a little extra butter and milk. 2. 3 cups oatmeal is way too much IMO. 2 cups works well so they don’t dry out. I have made these cookies for almost 30 years. They were always requested more than any other treat. My recipe is the same except I use 6 Tablespoons of cocoa. I love your recipe here, I make cookies like this with the grandchildren, we love adding dried fruit or shredded coconut , so delicious!! My mother made these In The 1950s. . She added 1/2 tsp salt to the boiling mixture. I remember because one time I reversed the salt and sugar, what a need the salt help them set up better. I should try the salt next time. Mine never do get hard enough. Sometime you have to eat them with a spoon. Such a classic and beloved recipe! Yum! Can you substitute sugar with honey? I love, love, love these cookies! We had them when I was in elementary school a long time ago. Easy to make and everyone I know loves them. I even get requests to make them! Made these per the recipe and they were Amazing !!! Just as I remember from being a child. Yum, this is one of my favorite recipes my Nannie makes me! I used swerve granulated 1cup, natural peanut butter which made them low carb. Yum!! I believe 2 cups sugar is way too much for me. I made them today and used just 1 cup sugar. They are just right! Hi just want to ask, is it ok to use semi-sweet chocolate instead of cocoa powder and skip the peanut butter part? Thanks. So far this is the only recipe I could find with the same amount of cocoa powder as the ones my grandma made! Everyone else’s doesn’t actually have that rich chocolate taste I remember! How do you store them after they sit up? Do they need to stay in the fridge? I make these. No refrigeration necessary. Just store in air tight container or they’ll dry out. So easy and love the chocolate. I want to add pecans. Will this work? We add coconut all the time. Makes these things even more rich than they already are. I agree about cutting the cocoa to 4 Tbs but if you add heavy whipping cream instead of milk and definitely use butter over margarine you get a smoother and richer cookie. The recipe that I have, from my mother-in-law, from the early 70’s, has the same amount of cocoa powder. Try using Amish butter you will never use anything else after that : ) yummy for any tummy !!! Family favorite. Our recipe is similar. We didn’t add peanut butter. Cocoa was 4 Tbsp.. Oats were 3 1/2 cups. Rest was the same. I have found that the quick oats blends into the chocolate mixture in smaller pieces; the Old Fashioned oats are flakier, with more defined oatmeal taste. It’s mainly a matter of preference, as both taste great. I switched to almond butter, dark cocoa powder, and raw sugar. My cookies taste great and firmed up a bit soft, stuck to the wax paper, and were sticky to the touch when handled (so much you have to lick your fingers clean after eating one). I’d like them to firm up a bit more. Has anyone else addressed this (with a little flour, xanthan gum or something else) to make the cookies firmer and not sticky? Cook the liquid a bit longer. Do a candy test: When a drop of hot liquid dripped into a glass of water rolls into a firm round ball, it’s done. Then add oats, PB, vanilla & spoon out. As a side note, I’ve found that most confections don’t set well if they are in a damp area or are cooled too fast (makes them sweat). Does it matter if you use quick oats or long old fashion cooking oats? I’ve used both but the ones I’ve made with old fashioned oats don’t set right for me. I’m sure my mom used regular oatmeal cause that did not have quick oats back then?? Can I use regular oatmeal instead of quick cooking oats? Yes you can, in fact I refuse to use quick cooking oats. I use regular oats as I like the texture better. I also like the tip about cooking for only 90 seconds, I have regularly over cooked mine and they tend to firm up in the pan. Not bad if you like cookie “bites”, but that is not how I like to enjoy them. How about sucralose instead of sugar ? Is it still doable ? I have not tried it with sucralose. Let us know if you give it a try. Curious to know how the cookies turned out using the sucralose? This is almost exactly our “family” recipe, except we swap milk for water. It’s a lovely chocolate punch in the teeth and it’s perfect for a small indulgent treat (trust me you don’t need more than one!). Thanks for the recipe, the measurements are perfect! I’ve been making these for almost twenty years (and I still lose the recipe every time), but this time I swapped the butter for a “Light” stick butter I found last shopping trip. Still works and tastes great! Do I have to use peanut butter in this recipe? Will it change the texture or ruin anything? The ones I make are nearly identical and without peanut butter, so it’ll be fine. Did you try it? My favorite variation has no peanut butter, includes a generous pinch of sea salt to the pot at the beginning, and swaps special dark chocolate cocoa powder for the regular kind. I also use less vanilla, only 0.5 tsp, and also boil mine for at least 2 minutes. They keep well in the freezer. I have made these cookies since 1975 & without peanut butter as I am allergic. This cookie is very nostalgic since I am now 54. My granddaughter and I made these cookies in a hotel that had a kitchenette. However, we were unable to locate a cookie sheet or equivalent. We thoroughly cleaned the kitchenette counter (granite) and put the cookies on the counter where they hardened satisfactorily at room temperature! The recipe turned out good. Made these all the time for my family. I think this recipe calls for more cocoa than I used in my old recipe. I made these all the time growing up, but always forget the measurements. I made them vegan with vegan “butter” and almond milk. They set up beautifully! They’re definitely FULL of cocoa– mine look much darker than your pic– but I love them this way! Much is in my family recipe. Love it, thank you!! I love this recipe!! It reminds me of the ones they made in grade school. Definitely too much cocoa powder. I knew something seemed different when I made these this time. The 90 second tip is the secret to success. I used rolled oats instead of the quick and it came out dry this time. Maybe i’ll increase the butter a bit next time? My original recipe from the 70’s uses 4T cocoa and 4 T butter.